Published by Jonathan Cape, 2011 . In her third collection, Flynn examines and dismantles a fugitive life. The first sequence moves through a series of interconnected rooms, reflecting on aspects of the author’s personal and family history. A tongue-in-cheek ‘Gothic’, the poems use the tropes of haunted houses, maddness, doubles and ghosts, to consider the importance of inheritence and legacy. The second poem comprises a long poem, ‘Letter to Friends’ written in the months leading up to banking crisis and presidential election of October 2008. Essaying a more public voice, inspired partly by Auden’s ‘Letter to Lord Byron’, ‘Letter to Friends’ reflects on aspects of the rapid social and technological change of the last decade. Its collapse back into personal griefs, including the poet’s father’s decline from Alzheimer’s disease, is pursued in the third section of the book. Here the theme of a tallying of private and public balance sheets widens to consider different kinds of profit and loss, and the possibilites of hope and despair. 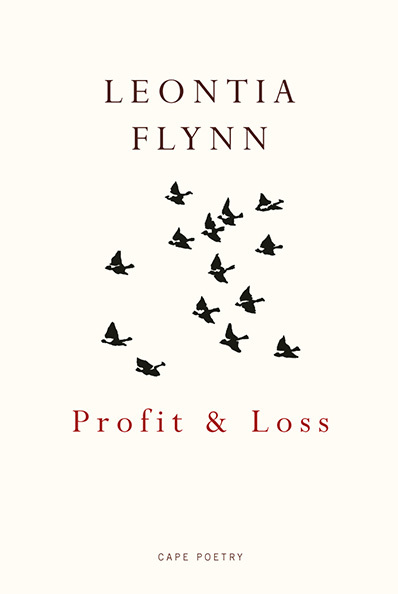 My favourite book was Profit and Loss by Leontia Flynn (Cape), demonstrating her unrivalled capacity as a good-humoured but devastating observer of the modern secular scene. ‘Letter to Friends’, Flynn’s long poem about the way we live now, is a masterpiece. … a stunning third collection. Though she’s the youngest poet on the [T.S. Eliot] shortlist Flynn writes with a sharp-eyed almost fatalistic wisdom. Her striking 320 line poem in iambic pentameter ‘Letter to Friends’, could be described as a State of the Union address – one that is highly personal but that takes stock of the larger world. It is this broad view that is one of her great strengths, as is her tone: sometimes earnest, sometimes irreverent, but invariably appealing. Profit and Loss is a serious book, engaged with the world in which we live; and it is engaging too – thoughtful, prescient and eminently readable. Flynn’s humour, her ability to entertain, and her astute powers of observation are wonderful gifts. She is one of the most original and accomplished poets of her generation: her voice is distinctive, and her technique as lightly and deftly carried as her learning. Whatever else is gained and lost over time, these poems at least will be “handed down”. Flynn’s place as one of the strongest and most skillful poetic voices of her generation is confirmed in Profit and Loss… [In Letter to Friends] The poet’s voice speaks clearly through the stanzas of this poem in lines that are rhymed and enjambed with exemplary wit and syntactical care …Flynn’s decision to cast her verse letter in a form famously used by WH Auden in his Letter to Lord Byron – the “conversational song” in which he said the “average poet” is “unobservant, immature, and lazy” – was spot on. Like Auden, she addresses important issues here in a language that is both playful and serious, and in a form that is, if not “large enough to swim in”, at least robust enough to contain the many concerns she raises in it, from the delights and torments of personal and familial memory to the function and value of poetry in (postmodern) society.